In December Bolton’s Clandestine Cake Club had the theme of ‘Jingle all the Way’. I knew straight away what Christmas themed cake I wanted to do. My Chocolate Snowball cake has become my ‘go to’ Christmas dessert recipe as I’m not a fan of Christmas pudding so this is what I usually bake. 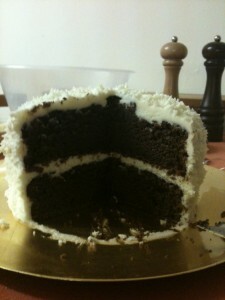 It’s a very dense chocolate sponge with a simple vanilla buttercream. I love the contrast of the dark chocolate colour against the white topping, it’s quite impressive when you cut into it, and even though it’s a bit of a beast of a cake, it’s not too rich or sickly. 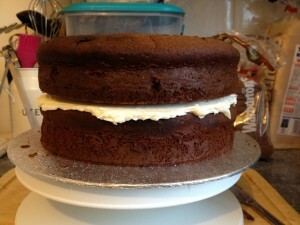 I think the vanilla goes well with the chocolate sponge and stops it being too rich. Pre-heat the oven to 170 degrees C/375 degrees F/gas mark 5. Grease and line two 20cm cake tins with greaseproof paper. Break the chocolate into pieces and place in a microwave safe-safe bowl. Melt on a medium setting in 30-second bursts until completely melted. Stir well between each session. Alternatively, place the chocolate in a heatproof bowl over a saucepan of barely simmering water. Stir occasionally until completely melted. Set the bowl aside to cool. In a large mixing bowl cream the butter and sugar until the mixture is pale and smooth, which should take 3-5 minutes using an electric hand mixer. Put the egg yolks in a separate bowl and beat them for several minutes. Slowly add the egg yolks to the creamed butter and sugar and beat well. Add the cooled chocolate to this mixture and again beat well. Combine the flour, baking powder, bicarbonate of soda and salt in a separate bowl. Combine the milk and vanilla extract in a jug. Add one third of the flour to the creamed mixture and beat well. Pour in one third of the milk and beat again. Repeat these steps until tall the flour and milk have been added. In a clean bowl whisk the egg whites, with clean beaters, until soft peaks start to foam. Carefully fold the egg whites into the main batter using a metal spoon (do not beat or you will take all the air out of the mixture.) I find at this point that the batter is almost mousse like, it’s not a usual cake mixture consistency. Divide the mixture evenly between the tins and bake for about 30 minutes. Insert a skewer in the centre of the cakes – it should come out clean when it’s cooked. Remove from the oven and leave the cakes in their tins for 10 minutes before turning out onto a wire rack to cool. Peel the greaseproof paper from the bases of the cakes. 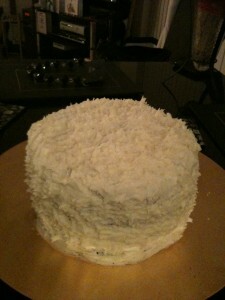 Whilst the sponges are cooling make the buttercream frosting. Sift the icing sugar into a bowl, add the butter and whisk on a low speed using an electric whisk or a freestanding electric mixer with the paddle attachment, until fully combined and a sandy consistency. 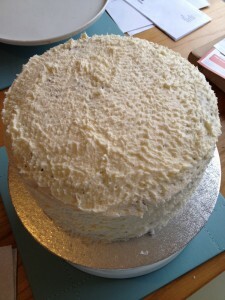 Add the vanilla essence to the milk and pour into the butter and icing sugar while still mixing on a low speed, then increase the speed to high and whisk the frosting until light and fluffy. When the sponges are completely cooled sandwich the two layers together with the vanilla frosting and cover the top and sides generously. Use a fork to create texture on the outside of the cake. I like to add a little translucent glitter over the top of the cake too as it adds a nice Christmassy shimmer!